Every sports league in the world provides a few games that fans would pay to miss. 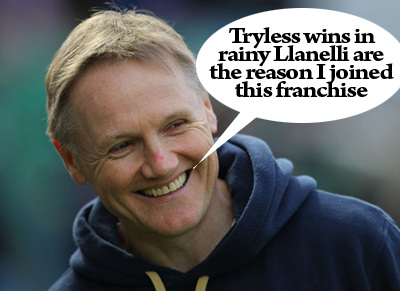 Llanelli entertained hosted Leinster on Saturday for their 5,000 game and it’s probable that few have been worse. For Leinster there were only four redeeming points, but those points served to hoist them up to 6th place in the Pro12 League Table. Even Joe Schmidt acknowledged in his post-match interviews that skills were at a premium on an evening in which only Isa Nacewa maintained his reputation. Why doesn’t Ian Madigan use his kicking game in bad weather? How can we get more ball to Isa, Fionn Carr and Dave Kearney – all three of whom look in good form but starved of ball in attack? At the moment Leinster are hanging on to the League front runners, Munster, Ulster, Connacht & Ospreys. With 24/25 players unavailable and no squad depth as a consequence, that seems a creditable performance. But last week’s home defeat against Glasgow, followed by this very poor display, are worrying because of common traits. We have a decent line-out with Devin Toner, Damien Brown and Rhys Ruddock receiving darts from Strauss. HVDM, Richardt Strauss and Jamie Hagan are a quality front-row backed up by Jack McGrath and Nathan White in the front-row, so the scrum is generally solid: our set-pieces are producing ball. However, from 9 to 13, the decision making and game management are poor. We don’t have enough patience and focus in the opposition 22 to create real pressure on opponents, and we haven’t worked out how to best use our back three in attack. Joe Schmidt and Jono Gibbs have a real coaching challenge at present and if they come through this period with improvements in these areas, they will have demonstrated their real abilities once again. But most of all it’s down to the players wearing the shirts to cop on and take the opportunities offered by the absence of their colleagues. Home victories against Aironi and Connacht in the next fortnight must be targets. Eight points from those encounters would do wonders for confidence and league position. This entry was posted in Match Reaction and tagged Joe Schmidt, Leinster, Milky Bar Kid by dementedmole. Bookmark the permalink.